Does America Still Care About the Kentucky Derby? Oh Yes. Get out your big, extravagant hats and mix up a batch of mint juleps: It’s Kentucky Derby time. Horse racing used to be one of the big three sports in America, along with baseball and boxing. 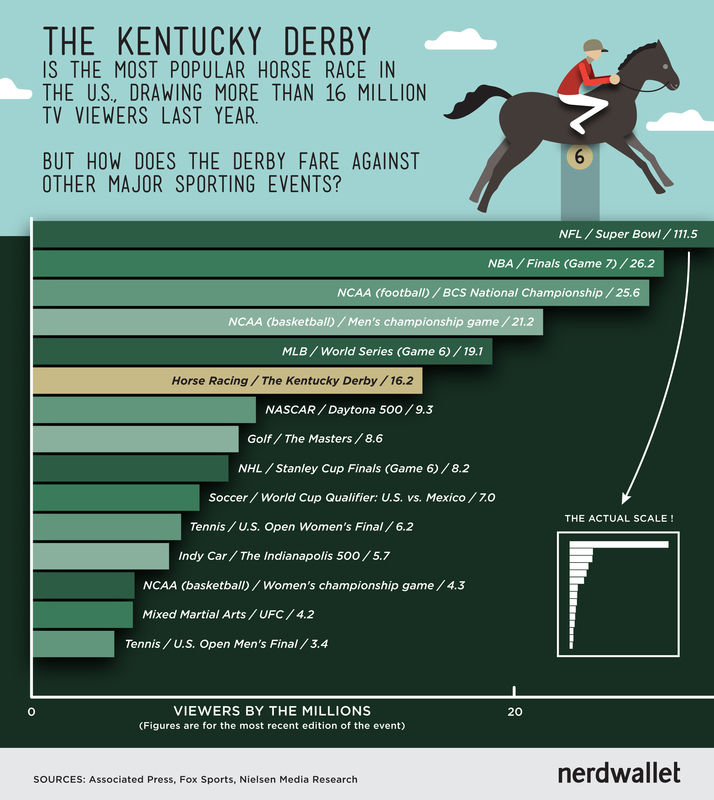 The Derby is still plenty popular, drawing more than 16 million TV viewers last year. But how does that stack up in the modern sports hierarchy? Ahead of Saturday’s “Run for the Roses,” NerdWallet put the horses on the track against football, basketball, baseball and more to see how the top-rated events in each sport rank in the race for TV viewers. “… not even close.” The Super Bowl crushes the competition, like Secretariat at the Belmont, and it comes as no surprise—the NFL has long since usurped baseball as the national pastime. It’s really a competition for second place, where the Game 7 of the 2013 NBA Finals squeaked by this year’s BCS National Championship game. That’s an upset, ladies and gentlemen. Most years, the most popular pro and college football games are an easy 1-2 finish among TV viewers. Other upsets: The Kentucky Derby came in sixth thanks to both a six-hour rain delay at the Daytona 500 (which saw its ratings drop from nearly 17 million in 2013 to 9.3 million) and a Tiger-less Masters (which saw a ratings slip from 14.7 million to 8.6 million). Women’s sports had a good year with viewers: with Serena Williams in the final, the U.S. Open final captured 6.2 million viewers, its highest ratings in 11 years and nearly double the viewership for the men’s final. And the NCAA women’s basketball championship game garnered 1.5 million more viewers than it did last year, thanks to an unprecedented matchup of two unbeaten teams in Connecticut and Notre Dame. Which NBA Teams Offer the Most Affordable Home Games? How Much are College Basketball Players Worth?